Pierre Kwenders (born José Louis Modabi) has been a staple of the Festival d'été lineup every year since 2014, and after taking in his evening set outside the walls of the Citadelle of Quebec, it was easy to see why. Not only is the Congolese-Canadian's blend of African music with hip-hop and electronic styles incredibly ambitious, but his energy on stage was nothing short of infectious. Kwenders was expressive not only in the way he moved about the stage to his instrumentals (which were further bolstered by a live percussionist and guitarist) but in his face, both when rapping and addressing the sizeable crowd in French. A multilingual musician, Kwenders raps and sings in English, French and African languages Lingala and Tshiluba, at times within the same verse. 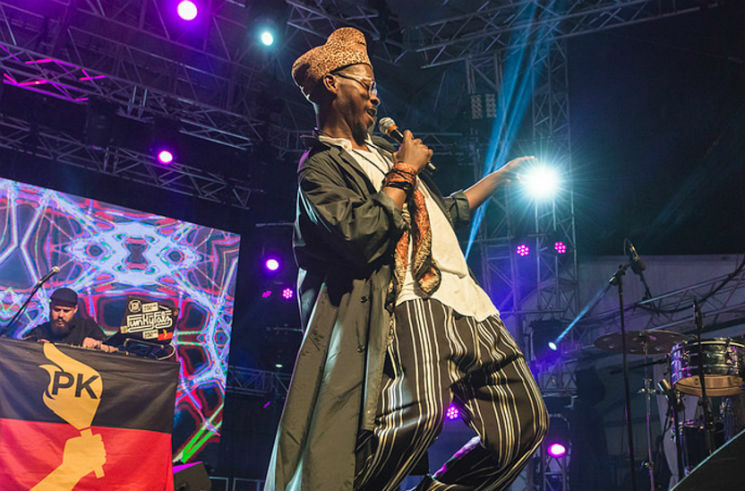 No matter the language, his delivery was smooth all the while, whether leading the crowd through the electronic-influenced "Popolipo" or "Ali Boma Ye," the latter during which he proceeded to lie down onstage while continuing to sing. In performing "Let It Play" to close out the evening, Kwenders came down from the stage to lead the audience in the song's hypnotic chant of "Hey eya e heya heya," expressing his love for everyone who watched his performance before leaving them cheering for an encore that unfortunately didn't come to pass.